You have to wonder just how much more Quantum and Woody could get done if they weren't at each other's throats. Alas, secrets between the adoptive brothers create a lot of turmoil just as Eric begins to work for The Wherehouse and Negative One begins to pull Woody's strings. It's a madcap comedy of brotherly infighting and weapons of mass destruction. What could go wrong? As a series, 'Quantum and Woody' is new to me but I've been aware of the action comedy from Valiant for some time. Valiant has some of the consistently best-reviewed titles in comics so I knew this latest volume would be another great time. In the spirit of buddy pictures like 48 Hrs., Rush Hour, and Lethal Weapon, Quantum and Woody is a story of opposites bound together by circumstances which leads to some hilarious exchanges. The superpowered Eric aka Quantum is the level-headed former soldier and nerd consistently clashes with the petulant and impulsive Woody. Add the fact that they have to come in contact every 24 hours to retain their powers or be vaporized they can't escape each other if they wanted to. In the last issue, Eric accepted an offer to join The Wherehouse to secure all the dangerous weapons confiscated from super villains.It's a vast facility with all kinds of crazy weapons including the mysterious Episilon Box. As wild as the climax of the issue may be there's a heart in all this madness that is centered around the bickering brothers. The flashbacks when Eric and Woody were kids are amusing and endearing. Eric happily playing Dungeons & Dragons with a bored Woody complaining and scowling juxtaposed with their present-day relationship shows that they haven't grown up all that much. But Woody's rage is well-founded once he learns that Eric knew the whereabouts of his biological dad and didn't tell him. It leads to some literal house-shaking fights and hurt feelings. Daniel Kibblesmith finds a serious undertone underneath all the wacky heist and weapons shenanigans. Woody is determined to find his real dad. Kano's art is a complete blast providing the perfect energy in design and color. The dynamic layouts and bizarre uses of goats add a playful visual motif that fits the tone of the comic. The flashbacks have an aged yellow sheen that separates it from the rest of the book. Despite so many design choices and bold colors, the art keeps pace and flows well. 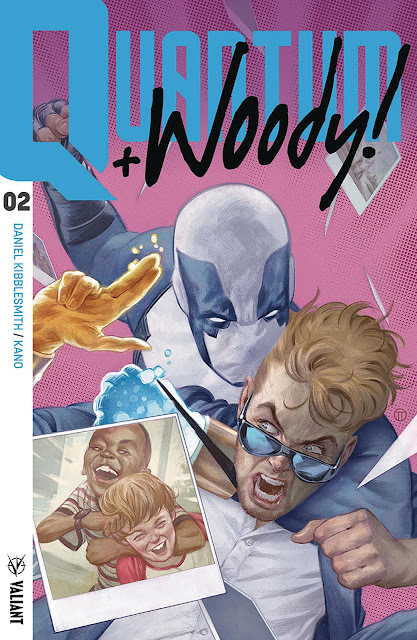 'Quantum and Woody' #2 has a lot going on but Kibblesmith and Kano make sure it remains grounded in brotherhood. It's funny, exciting, subversive, and beautifully illustrated. The buddy action comedy is alive and well at Valiant as 'Quantum and Woody' put the fun in dysfunctional.